Rohit did not have a nice day. Making himself a cup of coffee and excitedly unpacking the music system he had paid more than he had budgeted for, he ran into a wall. The manual wasn’t user friendly. The technical jargon was confusing. Rohit picked up the phone and called the contact number with a query. He had to wait on the phone for ages before someone responded. Then, he had to jump through the hoops, as he was transferred from one person to another and had to repeat what the problem was again and again. There are many long-suffering customers who empathize; they’ve been through it allthemselves and it’s frustrating. Even if the problem did get resolved finally, it hadn’t been a happy experience. One can be sure that a lot of people would hear about this customer experience – for the wrong reasons. Customer complaints end up on social media, on-line forums and elsewhere. This is the last thing a business wants after investment a lot of time, effort and money on customer relations. What is needed is a change of attitude: customer service is not a hassle; it is part of the service proposition. It is intrinsic to customer retention – cheaper and more sustainable than customer acquisition, specially in these difficult economic times. Research has shown that attracting a new customer can cost five times as much as keeping an existing one. A significant percentage of sales today happens on-line. It has been found that 83% of customers need some kind of help to complete an on-line purchase. It should be a courteous experience. The objective is to reduce customers’ perception of the amount of effort they have to expend. They should feel you WANT them to contact them if you are having a problem so they get a chance to put things right. The customer service team needs to be super-accessible, fast and effective. There needs to be a system in place to ensure that the customer is speaking to the right person. “I got to chat with someone on-line who actually knew things. It was quite refreshing,” said a customer. Such experiences should not be the exception but the rule. Getting an advisor or technical person to talk to the customer should not be seen as an inconvenient add-on. Reducing customer effort starts with the ease of finding a phone number or e-mail id. Contact options should be presented clearly: by e-mail, telephone, telephone from abroad, fax, post. The technical support number should also be stated clearly, so the customer can directly contact the person concerned. Many customers feel their queries are not properly answered and they have to root around FAQs. There’s a lost opportunity here. By answering the customer’s queries and going out of one’s way to be helpful, the customer service executive not only helps customers overcome any issues with the process, he can actually get them to consider an additional purchase. Incidentally, you can steal a march over the competition if you sound helpful on a holiday and don’t make the customer feel that it’s an imposition. Automated phone answering systems may be a solution but they do take the personal one-on-one interaction out of the equation. Automated answers should not be seen as a substitute for answering questions on-line which allow for further details and explanations if the customer needs them. Nobody wants to talk to a machine specially if he has a vexing problem. 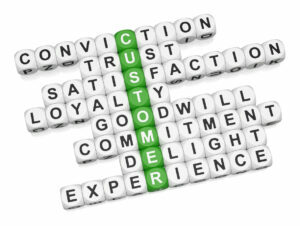 Good customer service is likely to swell your marketing effort. Word-of-mouth and social mention increases as a result of good service. Companies that don’t make it easy for customers to contact them are walking away from a goldmine of additional revenues via cross-selling as well as customer loyalty, which is truly invaluable.